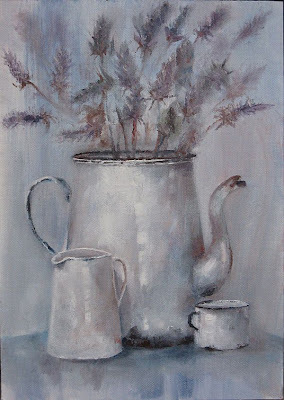 I have never liked still life and it was a bit of a battle to get to grips with painting it, but it helps if you really love what you are painting. My boots were like that, and now this old kettle just took my fancy. I call this "Kitchen Art" A row of these could look really great in a kitchen. Your paintings are so dreamy!!!! Painting I can do - it's all the tech stuff that confuses me - even tho I built my own website!!! Obviously the local Zelcol Cadmium must be the light because it mixed beautifully! Blogger is just so easy, you will be away in two twos! You reply to comments by leaving your own comment!Easy!